US Service Animals - Miniature Horses as Service Animals | What Can They Do? Although the majority of service animals are dogs, there is a small proportion that can now be miniature horses. The American’s with Disability Act (2010) revised regulations and allows miniature horses to be individually trained to work and perform tasks for a person with disabilities. A service animal is defined as an animal that ‘is individually trained to do work or perform tasks for a person with a disability’. In 2011, the only animal recognized as a service animal was a dog. However recently the laws have changed to allow miniature horses to be trained to work and perform tasks for someone with a disability. These are new and separate provisions from the ADA which allows both service dogs and service miniature horses to be recognized as service animals and support a disabled person. Under the American’s with Disabilities Act, the new regulations state that places and policies that are already in place must now permit miniature horses, where reasonable, to be treated the same as dogs. As miniature horses are much bigger than dogs, they have to follow more regulations to ensure they are providing a safe service to their owner as well as the people around them. Service horses will be trained and work just like service dogs. Miniature horses are best known for providing a service as a guide animal where they help guide someone who is blind or has visual impairments. They also work well as an emotional support They are less common as a service animal but it has recently become law that both dogs and horses only can be working service animals. As they provide excellent assistance as guide horses, they have the ability to keep their owner safe thus providing safe support as a service animal. All service animals must be trained to a high level but they should also possess very good behavior and ability to be under excellent control before they are considered. They have to meet the needs of their individual owner, working to their individual needs and disability. Just like all service animals, service horses will respond to their user, pick up dropped items and medication and support them in public places, helping them live a more independent life. Training a miniature horse is very extensive and more intense than training a service dog because horses are often easily spooked. They need to become desensitized to these situations by working calming through distractions. This is to ensure they will not become spooked in a social situation and become unsupportive to their owner. Because of this, a lot of hours are needed to help train horses and adapt them to the house, tasks, and environment for the owner to be comfortable. There are many benefits of having a service horse and some often prefer a service horse over a service dog. Firstly, horses live a long time (up to 35) and can work for 20 or so years which provides support to their owner for a long time. 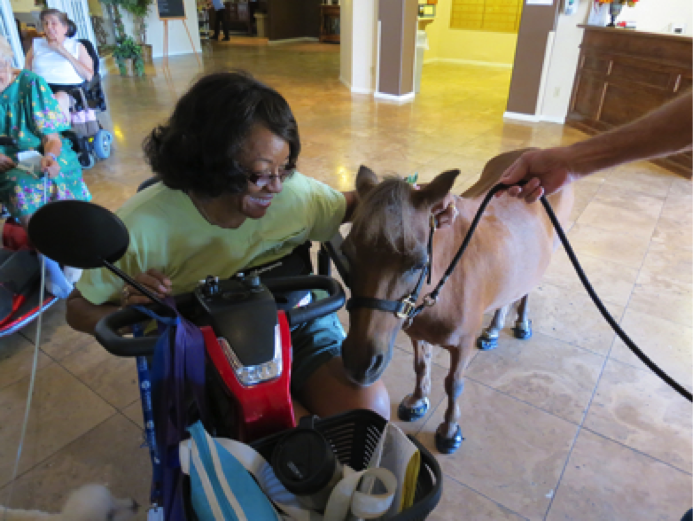 Miniature horses are a great size to support someone with a disability that impairs their mobility. Because they are at the hip height and have a strong, well-built body, service horses are an ideal size for someone who is struggling with their mobility and often loses their balance. Miniature horses are very easy to groom and don’t shed or trigger allergies like dogs often do. They also can’t get fleas like dogs, a great benefit of having a service horse over a service dog. This means a service horse would be more suited to someone who is very sensitive to hair and has severe allergies or hayfever. Dogs are very social and hyper animals and although they are trained extensively so that they are calm when working, they still have a big social drive. Miniature horses, however, do not have the social drive which means they will happily stand quietly for a long time whilst working and out in public, without making a sound. Mini horses are also house trained very easily and only require a call amount of outdoor space so adapting them to the owner’s home should not be a problem. Some religions do not allow people to work with dogs so a miniature horse is an excellent alternative to this.